Britain's women took two silvers at the 2015 Trampoline, Tumbling and Double-Mini Trampoline World Championships in Denmark on Saturday. European champion Lucie Colebeck, 19, split China's Jia Fangfang and Chen Lingxi to finish second in tumbling. 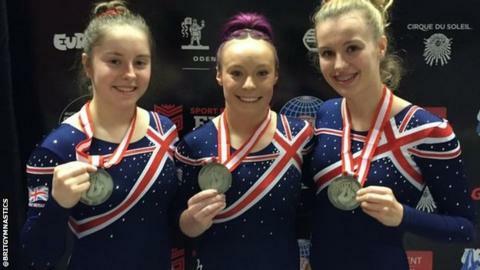 Britain also claimed silver in the double-mini trampoline team event, with Canada taking gold and USA bronze. Kirsty Way, Sapphire Dallard and 2014 individual world silver medallist Nicole Short completed the team. "It's Kirsty and Sapphire's first World Championships, so I am absolutely made up with the result," said Short. A men's tumbling team of Mike Barnes, Elliot Browne and Kristof Willerton finished fourth, with China taking gold.